My dad used to cook this dish almost every single day for over twenty years at the restaurant. Although I had seen it being prepared many times, unfortunately, I paid little attention to the nuances of the recipe. It took many years and many trials to finally be able to replicate this dish to fit my remembrance. Stuffed Cabbage can be made two different ways. First is Hungarian Stuffed Cabbage using sauerkraut and the other is the Jewish way, with sweet tomato sauce. The latter is what I clearly remembered. 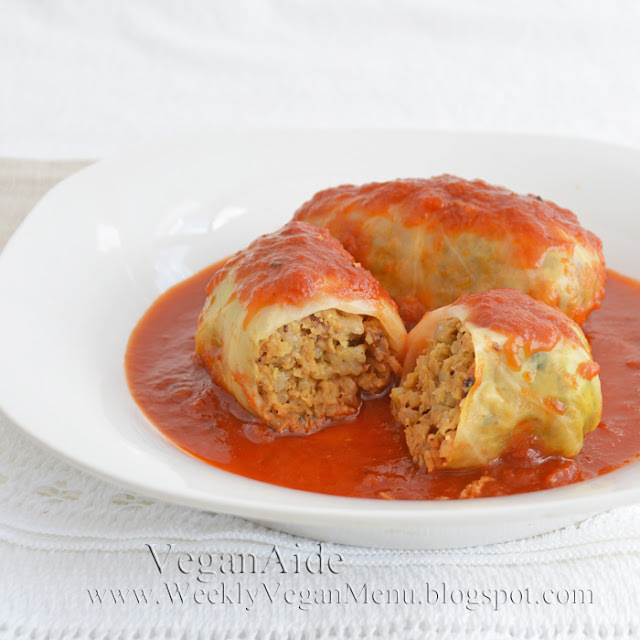 The filling in stuffed cabbage is typically of ground beef and rice. Replacing the ground beef with a ground vegetarian protein is relatively a simple matter, however, it is too easy to create a dry, pale version of the original. To combat the dry filling of ground vegetable protein and rice, I decided to use arborio rice in lieu of the regular white rice. The arborio rice, once cooked risotto-style, becomes creamy, adding much needed moisture and a binding quality to the filling. This worked beautifully! We loved it! The tomato sauce is a very easy three-ingredient mixture. My dad, I am sure, would be proud. The Stuffed Cabbage needs to cook for quite a while to ensure that the leaves are tender. A slow cooker comes in handy for this purpose, otherwise simmering it on the stove until tender is good enough. Please contact me in the next few days to claim your prize. "Whole Grain Vegan Baking" Blog Tour. This was another cookbook I tested for and Tami Noyes and Celine Steen want me to give away a copy. I will also give you a sneak peak at a recipe from the book. Come back on the 14th for your chance to win!